Domestic tourism is harder to analyse compared to international tourism due to its smaller data footprint generation, as most times private means of transport are used, no border is crossed, and no lodging is registered. Digital data sources can be a useful, but still underused, complement to official survey-based statistics to fill this lack of reliable information. The present paper covers a research gap in the use of card transactions data (on site payments and cash withdrawals) to provide an innovative methodology to enhance vision on domestic tourism dynamics. The chosen approach is based on the United Nations World Tourism Organization definition of ‘usual environment’: “the geographical area (though not necessarily a contiguous one) within which an individual conducts his/her regular life routines” Upon this premise, a methodology has been developed in order to use transactional footprints of cardholders to delineate their usual environment, and subsequently to classify transactions as ‘touristic’ or ‘non-touristic’. So as to ensure scalability, the resulting procedure is non- territory reliant, and can therefore be adapted to different geographies by varying one single parameter. Some practical applications are described in Sect. 5 through two use cases carried out in Spain and Mexico by BBVA. 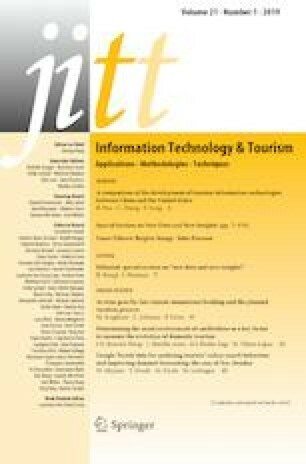 This is an extended version of a conference paper entitled “Using Transactional Data to Determine the Usual Environment of Cardholders” previously published in the proceedings of Information and Communication Technologies in Tourism 2018 Conference (ENTER 2018) held in Jönköping, Sweden, January 24–26, 2018. The authors would like to thank the two main institutions whose partnership made possible the outcome of this paper: Banco Bilbao Vizcaya Argentaria (BBVA, a global financial corporation) for providing the dataset for this research. Special thanks to Elena Alfaro Martinez, Jon Ander Beracoechea and Fabien Girardin for their support to this applied research project. Exceltur (Alliance for Excellency in Tourism, a non-profit group formed by the Chairmen of the 23 leading Spanish tourist groups), and specially to Eva Hurtado and Óscar Perelli, for providing useful insights and stimulating discussions around current gaps in tourism intelligence, and inspiring suggestions about the methodology followed in this research.